Breath & B.O THAT’S NOT supa fresh? A constant STRUGGLE to lose weight? Cravings THAT OFTEN GET the best of you? OR do you just not “feel 100%,” despite eating A BALANCED DIET? If you said, “THAT’S ME!” to any of the above, it MAY be time to consider a DETOX! Before you run for the hills in fear that I’m going to put you on some sort of flush, or ask you drink a chemical-based milkshake, HEAR ME OUT - Because I’m about to dispel a 💩-ton of myths about what the word detox ACTUALLY means. The only 30-day online and interactive program of it’s kind. Let’s face the facts: We live in a toxic world. In this day and age, our bodies are constantly bombarded with toxins - Be it through the water we drink, the air we breathe, the chemicals in our skincare products or the pesticides on our food. As a matter of fact, over 80,000 chemicals have been introduced to our environment over the past 100 years. Someone once told me that, "If you're not detoxing, you're re-toxing." This may not have been the case 100 years ago, but today, I fully believe it to be true. And to be completely transparent, I'm no stranger to the world of Detox. I’M AN ONLINE HOLISTIC NUTRITIONIST & SELF-PROCLAIMED GUT HEALTH & DETOX WARRIOR. Just a few short years ago (and amidst my first years of motherhood, no less), a gut illness nearly took my life. It took several years, tens of thousands of dollars, dozens of tests, specialists, many conventional and holistic practitioners and reaching a point of near sepsis before I finally found someone who could ultimately help me find the cause of my suffering. Through this experience, I saw just how difficult it was to uncover the root cause of my condition and to begin reversing the damage that was done. With patience, persistence and by the grace of some sort of higher power, I not only survived, but I discovered some incredible tools that would EVENTUALLY facilitate change in the health of myself, my family, friends and clients. It started with my kitchen and a look at my diet. What sort of toxins were sneaking their way into my body via my food? What herbs or ingredients could help each system work to its fullest potential? Next it was a look at my cookware, food storage, and even my spice cabinet. I could hardly believe what I had found! After that, I was surprised to learn that even the shampoo I was using contained hormone disrupting chemicals, and my cleaning products were loaded with carcinogens. Not only was I sick, but my home was toxic. Finally, I had to look inward. How was my fear of this mystery illness impacting my ability to recover? What could I do to ease my stress and rebalance my energy? As I began to create change in both my home and my heart, I started to see changes in my health. The process was not an overnight one for me, and I want you to know that it will likely be the same for you. THIS 30 DAY PROGRAM IS NOT A QUICK FIX. AS A MATTER OF FACT, THERE’S NO SUCH THING. True, lifelong change takes time. path to true, lasting wellness. Then buckle up, babe. LET’S DO THE DAMN THING. …But can I be honest? …Many detoxes are UNSAFE and do not promote physical or emotional health. …Quick fixes don’t support lasting results, but they can cause you to develop a dysfunctional relationship with food. …If your home is a toxic environment, you can eat all the greens in the world and still not see results. …If you’re detoxing in an unhealthy way, it can be unsafe and even damaging to both your body and mind. The word detox does NOT have to be a dirty one. Get ready to discover how to nourish your home, body & mind for a lifetime in just 30 days! long-term shifts in your diet and lifestyle. 4 weekly jam-packed digital, printable guides overflowing with every piece of information you need to get the results your body craves — think of it as the ultimate go-to resource on all things detox! 4 weekly printable action plans to help you along your journey. Remember: It’s a marathon, not a sprint! These action plans will help you stay focused on what works best for you! A mouth-watering Recipe Guide packed with dozens of gluten, dairy, peanut and soy-free food and drink ideas to keep you satisfied and toxin-free! Weekly shopping lists to make your trips to the grocery store 110% hassle-free! a 30-day completely customizable meal plan full of nourishment, simplicity and delicious FLAVOUR! A Food Diary to help you reflect on how your meals make you feel while unleashing your maximum potential! You' re not only getting the FOOD recipes! You’ll have printable recipe guides for DIY natural skincare products, cleaning products, and a few fun surprises, too! Access to our 100% private Facebook community of fellow DETOX30 participants. A great place to connect, ask questions and share your experiences throughout the program! Priority access to yours truly—A Holistic Nutritionist who has BEEN THERE. I’m here to help you succeed! Get ready, because we’re going to learn SO much in our time together! Welcome to the program! In our first session, we’ll review our schedule, we’ll discuss how the program will run, and we’ll also have a look at the meal plan as we go over tips that can help you achieve the best success through our time together. We’ll dive into the mindset piece of creating sustainable change, and the reasons that many programs do NOT facilitate lasting results. 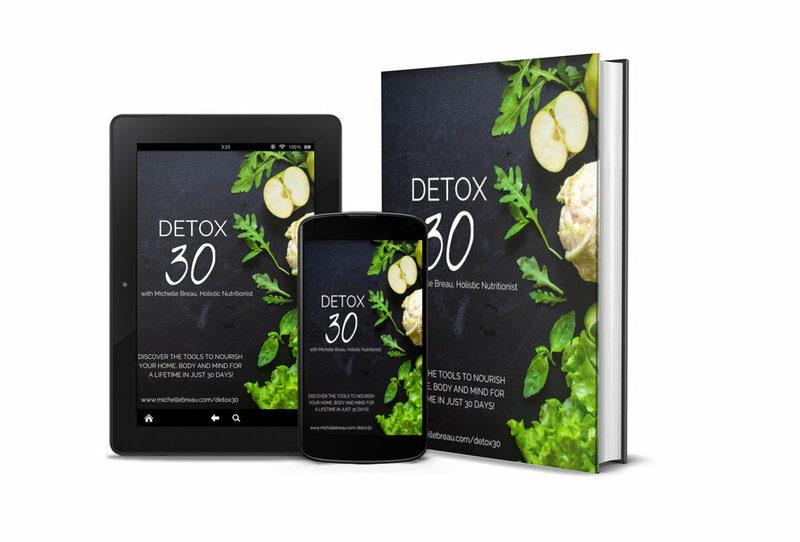 I’ll share more about my, “Detox top 3,” the 3 most effective and sustainable detox practices you can begin to implement TODAY. And finally, together we will redefine what it truly means to safely and effectively detoxify our body, mind and living spaces. Note that each session is live and completely interactive, so bring a pen and paper, as well as any questions you may have. I will remain on LIVE until all of your questions have been answered! In week two, we’re covering all things HOME detox. Let’s review each room in the house and discuss places that can commonly house toxicity. We’ll begin in the kitchen with a look at our cookware and food storage options, our fridge, oven, and even our floors. We’ll discuss water quality and safety, as well as spaces that require specific methods of cleaning (For example, your wooden cutting board!) And of course, we’ll cover your food itself! What toxic chemicals or additives could be lurking in your pantry? Did you know that some of them could be causing your body to crave sugar, salt and caffeine while also making healthy food taste less than appetizing? Don’t worry - There’s a way to remedy this! Next, we’ll head to the bathroom to review everything from how to protect against mold and mildew, to the safety of your shower and bath water, and more. Finally, we’ll end in the bedroom, where we’ll discuss everything from the health of your laundry and bedding, to how certain types of light may be impacting your sleep and hormones. We’ll discuss air quality (after all - We spend 1/3rd of our lives in this room! ), how to create a health-promoting evening routine, and more. In week three, we’ll dive into the health of your BODY! 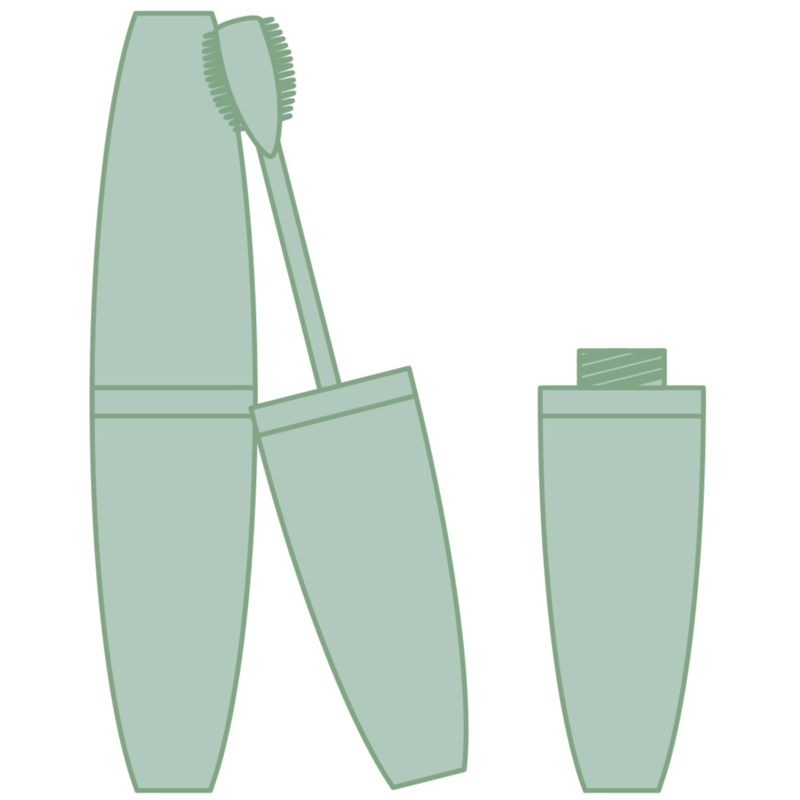 We’ll take a look in your cosmetics bag and talk about how to understand the ingredients found in each product. I will provide some resources on how to be truly informed about all things makeup, skincare and feminine hygiene, and how to find safe and effective products you’ll love without breaking the bank. We’ll talk about your lymphatic system (the body’s sewage system!) and a few key practices you can begin to implement right away that can help it work more efficiently at eliminating toxins. In session three, we’ll also cover the importance of sleep in a way you’ve likely never heard of before, as well as take a deeper look into all of the different areas of the body that detoxify for us (the skin, liver, kidneys, lungs, digestive system, etc). Week four is all about MINDSET! If you experience anxiety or you lead a stressful life, this session will provide you with some life-changing tools and ideas to help. We’ll begin with an in-depth look at our autonomic nervous system and how it works so that you can understand exactly what you can do to support it. This translates to being better able to effectively manage and respond to stress, utilizing the breath to eliminate toxins (Did you know that we eliminate anywhere from 60-80% of toxins through our lungs? ), learning about how to catch ourselves amidst the cycle of negative self-talk so we can let it go, how to support our adrenal health (which often translates to a greater ability to adapt to stress, more energy and less brain fog), we’ll cover the ways in which FEAR can hold us back, and a few of my favourite gadgets & apps that can help us to rebalance our nervous systems in times of distress. Finally, we’ll cover how some electronics may be impacting your mental and physical health, and what we can do about it in a world where we are all so connected. it’s a movement. A revolution. I was looking for more than a quick fix. I wanted to help people facilitate change in their lives in a big way. This happened for me when I attended NutraPhoria School of Holistic Nutrition. I was always interested in health, but when I graduated as a Holistic Nutritionist, I wanted to create a set of programs that could help people take steps toward lifelong, sustainable change. But in the midst of my studies, I got sick AF. I never planned on being the “gut health + detox girl,” but I suppose you could say this path was chosen for me after I realized just how little support there is out there for the tremendous amount of people currently facing these sorts of issues. I felt a huge need to create the exact resource that I wish I had when I was in the thick of it. BEEN THERE. DONE THAT. GOT THE FLIPPIN’ T-SHIRT. If you’re feeling confused about what to eat or how to actually start feeling awesome again, you’re in the right place. With this program, I’ll teach you about health in a completely different way. These tools, tactics, and resources are designed to help you reduce stress, achieve your goals, live a healthier life, and learn how to balance everything that fills up your crazy schedule. NO MORE GUESSWORK. NO MORE FIGURING IT OUT ALL ON YOUR OWN. THESE ARE THE SAME TOOLS THAT WORK FOR ME, AND THAT WORK FOR MANY OF MY CLIENTS. And they can work for you, too. Don’t spend another ounce of energy thinking about when to eat or what to eat or which supplements can support you, because this program takes the away the guesswork. It puts YOU back in the drivers seat. your body, and your life back. And YES - You can TOTALLY do this. NO MORE DIETS. NO MORE CONFUSION. NO MORE MIRACLE CURES. NO MORE WONDERING WHICH FOODS ARE RIGHT FOR YOU. Not at all! There are recipes for breakfast, lunch, and dinner, and there is room for snacks in between. Every meal is delicious and was created to nourish your body from the inside out. This program is not about starvation or deprivation, and we are not counting calories or dwelling on carbs. You will feel satisfied with every bite. If you do get hungry, there are extra snack recipes included! Absolutely! If you feel tired, know that exercise restores both strength and energy. During this program, you will be eating protein and drinking plenty of liquids, so if you’re already exercising, there’s no reason to stop! It is important to remember that whenever you change the foods you eat your body changes as well, and that not all forms of exercise will work for you. That’s okay, and we totally discuss this in the program. Please consult with your doctor if you have any specific concerns about your health. DO I HAVE TO TAKE SUPPLEMENTS, PILLS, AND POWDERS? Not in this program! Please consult with your doctor regarding any supplements and do not adjust your current medications unless recommended by your doctor. If you are nursing, I suggest that you add consume enough protein per the recommendations of mothering.com, kellymom.com and always, always check with your doctor. All meals are loaded with protein, healthy fats, vegetables and snacks. Make sure you are consuming extra fat and drinking enough liquids, and know that you can implement only what feels best to you (For example: Switching to a non-toxic all-purpose cleaner is certainly not going to hurt! ;)). Please consult with your doctor prior to starting this program if you are nursing or pregnant. The goal is to help you feel strong and energized! In the beginning, your body may go through a “withdrawal phase” to re-balance as you consume less sugar, additives and caffeine. It is important to listen to your body through this program, and I will be here to support you with that. I will guide you step by step through exactly what can be done to reduce any unwanted symptoms that may appear. This program is completely flexible for figuring out what works for YOU! I DON’T EAT GLUTEN OR DAIRY. IS THIS RIGHT FOR ME? None of the recipes provided have gluten or dairy. I do talk about cultured foods such as Kefir but also give options for those who cannot tolerate dairy. There is ZERO gluten in this program. Some people go through this program and feel nothing but energized, while others may feel tired or light-headed as their bodies eliminate and let go of unnecessary toxins. Yeast (candida) alone releases upwards of 76 toxins into the blood when it dies! The experience will differ from one person to the next, but the program is designed with that in mind, and you’ll have access to all the tools you need to stay nourished and to help keep any unwanted symptoms at bay. Note that this is NOT a Candida cleanse, or a cleanse of any kind. The goal here is nourishment and support on all levels! Note: It is important to consult your physician before beginning any new eating or exercise program. This is a clean eating and lifestyle program designed to teach you the difference between foods that inflame you and foods that fuel you. These statements have not been evaluated by the Food and Drug Administration. This is not intended to diagnose, treat, cure, or prevent any disease. Did I miss anything? Feel free to contact me over on instagram, or send me an email to hello@michellebreau.com. You will receive a reply from yours truly within 1-2 business days.